There are some local shops selling basic necessities within walking distance. A slightly longer walk will take you to a few bars and restaurants near the Big Buddha statue and Plai Laem temple. It is within walking distance from the beach and neighbouring Choeng Mon beach is about 5 minutes drive away. In Plai Laem you will find a good selection of Thai restaurants along the road and a couple of restaurants and bars on the beach. For a real dining experience visit one of the dining venues at the hotels and resorts. One of Samui most famous and unique restaurant is located in a 5 star resort in Plai Laem area. For a pampering experience, you can try one of the inexpensive Thai massage places on the road or on the beach or visit one of the high end spas and retreats. 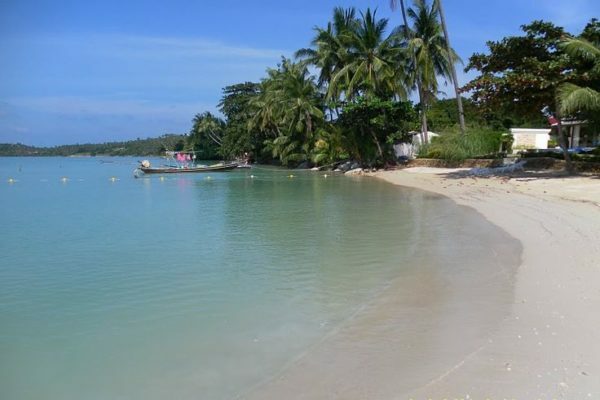 Plai Laem is a popular spot in Koh Samui, due to its location and fantastic views. Certain spots in Plai Laem offers fantastic sunsets. The sand stretches for 2 kilometers and is white and soft. The water is kept warm and calm by an of shore coral so it’s great for paddling or swimming, and a bit of snorkeling. You will spot the occasional Thai fisherman or visitor passing by, but it’s as close as you’ll come on the island to having your own private beach. There are small local shops within walking distance and several bars and restaurants a slightly further walk away down by the Big Buddha and Plai Laem Temples. Koh Som is opposite and reachable by kayak or swimming – depending on how competent you are in the water. The sea is 2 metres deep, so there are no jet skis and motorboats around – it’s too shallow, so the area stays quiet all day. It’s a great place for sunbathing and reading. Koh Samui International Airport is five minutes away.